Jibson, 30, studied Electrical Engineering at Colorado State. By day, he works Stack Exchange, a New York start-up that's trying to figure out how to solve the difficult problem of peer-to-peer question and answer. But by night he's long been an active member of GitHub, the open source community of coders. After Google announced that it was murderizing Reader, Jibson realized he wasn't really satisfied with the alternatives. Most of all, though he was just fascinated by the challenge: What if you could make a reader from scratch that's exactly how he wanted it? And so he went to it, from scratch, plugging away a few hours at a time after work 4 to 5 nights a week. And he got the technical challenge he was looking for. As he tersely put it in the blog post describing his project, "Feed readers are difficult." It turns out that all of that gobbledygook that supposedly outlines a feed's information isn't really standardized. He started a Tumblr collecting some 60 different methods for expressing a timestamp—all of which his reader would need to parse. But more than the thrill of the hunt alone, Jibson is big Google Reader fan, and by his own admission, the reader is supposed to be as close to a Google Reader clone as he could realistically accomplish within a few months. "It was good at presenting content in a usable, quick, simple way," he says. "I wanted the same experience," he says "Yes, I thought that the interface of reader was done right"
As with most of the other Google Reader alternatives out there, step one is importing your feeds. If you've got loads of them like I do, it takes just a few minutes to import. And then, just as you'd expect, there they all are. You won't see any frills, but you will notice how snappy feeds load. That is, when it's not suffering the early bugginess of a product rushed out the door. If you're trying to use it this morning, you've probably noticed it's slow, the result of overtaxed resources that Jibson is paying for out of pocket. If you're one of the legions who are lamenting the loss of a familiar daily companion—I'm one of them—this might be where you want to go. 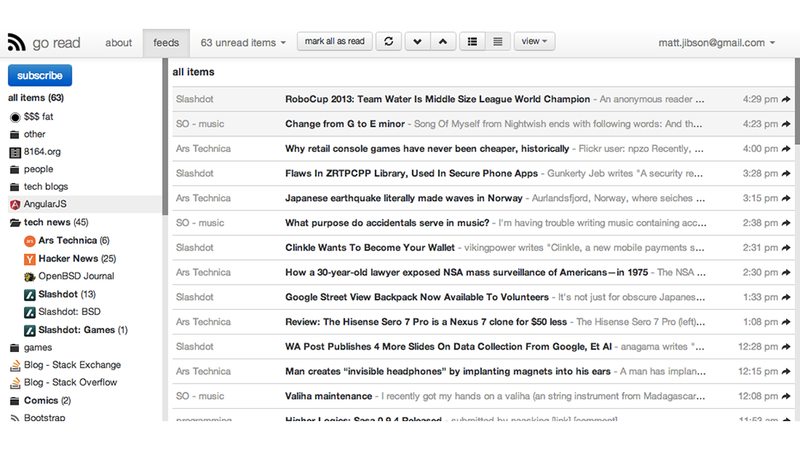 Go Read (Get it, "Go Read" from "Google Reader"? ), looks and feels very similar to Google's bare bones design. All the keyboard shortcuts still work, and the typography are similar. There are some obvious missing features like, ahem, search, but the basic feed reading experience is right there in tact. Jibson says he can't take too much credit for the look because he was just riffing on building blocks that are openly available. He points out that Comma Feed, another coder-initiated adventure built over the last months, looks similar because it's built from the same foundations. Which brings us to the all important question of why would a lone wolf dive into a a crowded pack. The more you look at the different configurations of the different readers, you start to realize that the core functionality of a reader is extraordinarily simple—the key is nailing the UI. And frankly, there are big teams with more resources to hammer out something revolutionary. Both Go Read and Comma Feed are focused on staying out of your way, and that kind of makes you wonder if in reacting to Google's departure, the competition might be ignoring some of the product's original appeal. Take, for example, the team at Digg that built a simple-looking RSS life raft. The principles on that project told me there's a lot more going on under the hood that isn't yet perceivable. The company has plans to expand the product into a reader that surfaces the good stuff using the same social data secret sauce as Digg proper. We can't evaluate the merits of those features until we see them. All of this filtering will appeal to some, but others might prefer to simply read their streams in the raw. In the last 100 days another up start, Feedly, has done bootstrapping of a different kind. Before, Feedly was basically a fancy overlay for Google's cloud-based backend. With Mountain View's generosity gone, it had to figure out a cloud solution for its snazzy design. Jibson says he doesn't have an opinion on the matter, but like a lot of us being left behind by Google, he's not trying to rebuild anything fancier than what Google gave us in the first place. And in a way, he's making a statement about what he wants from a reader simply by not developing it out. Jibson is building features he needs in as he needs them rather than building something complicated from the start. We'll have to wait and see how many people sign on to find out. As for next steps, well, Jibson set out to make the reader he wants to make sure he's going to keep adding features. He's been adding them as quickly as he can code them. In the short-term, he'll be looking at some pretty basic stuff like feed and folder organization and fixing bugs—he's been racing down to the finish line adding features as he can. For all its ambition and impressiveness, it's not quite running up to the speed most people will probably want in the long run. He doesn't know how far he'll ultimately go with Go Read, except that he's not stopping now. One thing that's clear is that the rate users are showing up, he won't be able to maintain without revenue for long. Right now, the plan is to cover the cost by offering people the choice of ads or a subscription fee. "There is no goal to make a profit, " he told me "although if it is doable without sacrificing user experience, I might consider it."